After the turkey is gone and a only a fond memory, after the visiting relatives have returned home and you are looking at returning to the normal routine, there is one more thing to check out this Thanksgiving weekend. 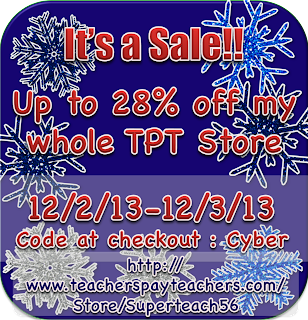 IT'S the CYBER MONDAY and TUESDAY SALE at Teachers pay Teachers. MONDAY DECEMBER 2ND AND TUESDAY, DECEMBER 3RD use the code: CYBER at checkout and you will receive not only my 20% store discount for the sale but an extra 8% off. Everything in my store will be 20% off so shop till you drop!